Disturbing details are emerging in the brutal stabbing of a Northern Virginia couple that began as a workplace dispute. Court documents say 31-year-old Andrew Schmuhl, armed with a gun and a Taser, posed as a law enforcement officer to get inside the McLean, Virginia, home of a couple in their 60s. 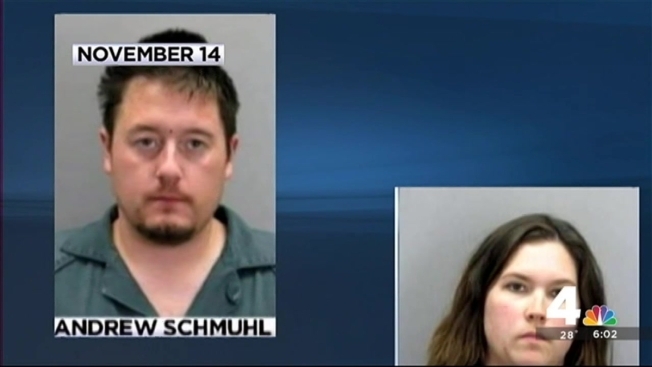 Schmuhl allegedly went on to brutally stab the couple, while his wife, Alecia Schmuhl, waited outside. Police have said the attack apparently stemmed from a workplace dispute. Alecia Schmuhl had worked with the male victim at the Bean, Kinney & Korman law firm in Arlington, but a law enforcement source said she had recently been fired. The female victim played dead after being stabbed and tased multiple times, according to Commonwealth's Attorney for Fairfax County Ray Morrogh. She was able to hit a panic alarm which caused Schmuhl to flee from the home, Morrogh said. The Schmuhls were arrested about an hour after the crime and officers discovered Andrew Schmuhl was wearing just a diaper. Andrew Schmuhl had been using a walker in court hearings, while his lawyer claimed he was disabled. Morrogh said the prosecution in turn showed a photo of the Schmuhls actively playing kickball in August. Andrew Schmuhl was denied bond Tuesday. His wife was denied bond last week.